An avid AT reader, Geelong’s virtually unpronounceable Reen Bloot’hoofd loves to write and travel, and has identified the one dish that crosses all class boundaries. The gritty golden sand tickles it’s way between my toes. Waves crash relentlessly to shore, the sun caresses my skin and seagulls squawk overhead. My greedy fingers move quickly to unwrap the layers of greasy white paper. A familiar smell of comfort teases my nostrils until, finally, I wrap my lips around that first big, fat chip . . . aah! Fish ‘n’ chips: a true-blue favourite that appeals to us all. 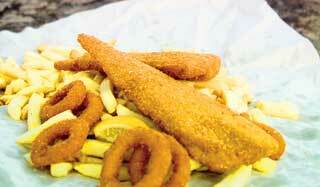 Fish ‘n’ chips don’t discriminate, but are enjoyed by youngsters, oldies, families and friends. They’re even the perfect solo dish. The cost of “minimum” chips may have risen over time, yet this Aussie delicacy is still affordable on a teenagers’ pocket money, and even the wealthy will forgo silver service for this meal. After all, who wouldn’t prefer to lick their salty fingers clean? This is a meal that’s unique, since it’s often more about the experience than the food. I fondly remember my childhood, when Friday nights were fish ‘n’ chip night. My brother, sister and I would run straight through the neighbouring vacant land to the local shop. Mum would stand at the kitchen window to watch us. We’d play touch-chasey while the chips cooked, before racing home again to devour our favourite meal. Years later, sitting on a rugged cliff-top as young romance blossomed, I was asked what type of chip appealed to my interest. Was it the long, chunky ones? Or the crunchy ends? I realized I hadn’t thought about it that hard before – I just liked them all. No longer wrapped in newspaper and now often served “gourmet”, little has changed, really, as fish ‘n’ chips remain a favourite Aussie meal. It’s the delight of choice: battered or grilled fish, dependable crabsticks, scrumptious scallops, crazy banana fritters or simple potato cakes. They’re enjoyed as part of a noisy family lunch in the park, an instant hangover cure with friends or as a quiet lunch on a Sunday drive with a loved one. Fish ‘n’ chip meals mean time together or time out alone . . . and either way, that means I don’t have to cook. Full and content, I stand to leave. Finger licking complete, I rip away a corner of paper to wipe away the final, sticky remnants. At last I give in to the relentless squawks from the hovering seagulls and throw the leftovers out, creating an all-in fight of the fastest amongst them. See? Even the seagulls vote fish ‘n’ chips as their favourite Aussie meal.